After my post a few days ago about NotebookPages.com’s Back to School Sale, I received some email asking me how I used the notebook pages in a Charlotte Mason style. I thought I would share how we have used their notebook pages over the years as a way to keep track of written narrations in various subjects. We have been using notebooking pages for a very long time in our family. It gives us another tool to use to encourage writing and an attractive way to record our narrations that have become a part of our everyday homeschooling life. 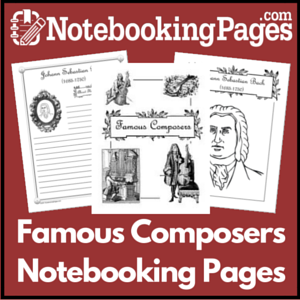 Completing a notebook page is an easy way to follow up composer study. We use the pages to record a short biography, a list of pieces we listened to over the course of our study, and then also to have a place to narrate the emotions that the composer’s music brings up inside us. It is a living record of our study and not just dry facts. The great part about using a pre-made set is that you can easily pull up the pages and print whatever you need as you go along. Sure I could make my own pages, but sometimes a completed notebook page would not happen if the pre-made pages were not sitting in a folder on my desktop. I definitely save time and use more pages when I have them all ready to print. 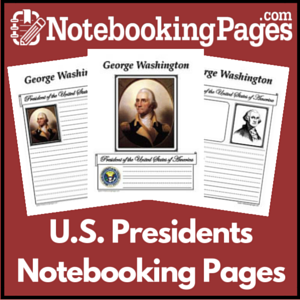 Another subject that I use notebooking pages for on a regular basis is history. History seems to lend itself to a good notebook page with a map, a scene from history, or a portrait of a historical figure. 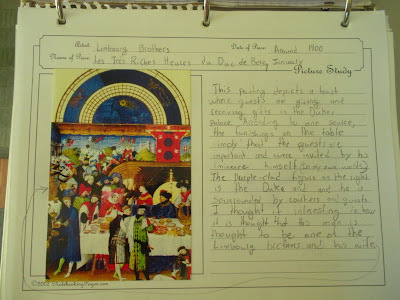 These are the pages where I let the boys record their summary of a daily reading, a short biography of an important person, the results of a research point that came up during their daily reading, or anything else they feel is worthy of remembering from their study of history. We do not use quizzes in our homeschool, but I can tell by reading their notebook pages whether they are gaining a real understanding of the material we cover. 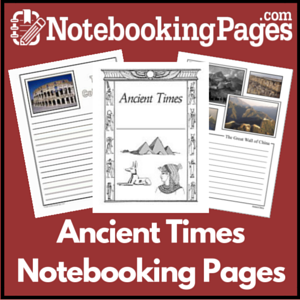 I highly recommend the Ancient Times Notebooking Pages from NotebookingPages.com. Click the link below to see samples and a table of contents. I slip them into a clear sheet protector and put them into my subject planner binder. On Monday mornings when we have our Tapestry of Grace planning meeting and we are planning our science for the week, I check for notebook pages that might apply to our week’s study. I then print out the pages and my boys insert them into their weekly work. Many times we will forget to check the lists and will miss a great notebooking page opportunity. 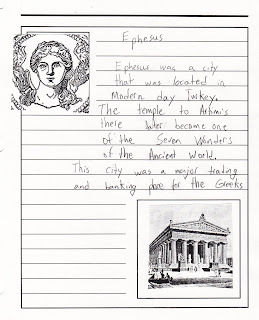 My boys like the history pages so much that they will request one to include just for fun or they will see the image or the title and then want to do some research and complete the page for their notebooks. I love that they inspire more thought and writing and are never a “fill in the blanks” sort of exercise. I have been know to give the boys a history notebooking page to use for spelling practice or to record their vocabulary or spelling sentences using Spelling Power. 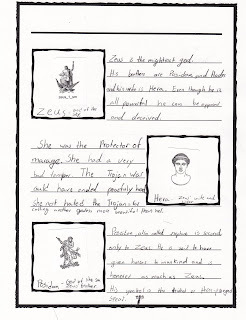 The Ancient History set of notebooking pages is a great complement to Tapestry of Grace Year 1. We used this set weekly during Year 1 for a beautiful notebook of pages by the end of the year. During Tapestry of Grace Years 3 and 4 there is a plan to complete a study of the American Presidents. I wish I would have had this set of notebook pages to use with that study. It would have made my life easier. Some of us dream of beautifully illustrated nature journals, but the reality is that our children need a little help getting started. I have found this set of notebook pages to be a great jumping off spot for helping my boys record their adventures in the outdoors. Printing some pages off and tucking them inside their sketchbooks have been a great way to encourage them to write about what they encounter in the outdoors. 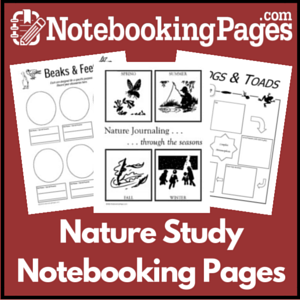 There is a page for every topic you can think of for nature study and you can even use some of the pages as a way to start off a focus study in a certain area of nature. 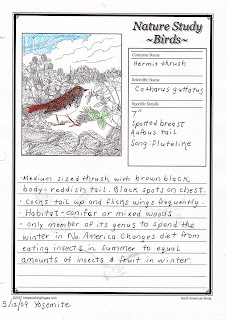 We have used the seasonal pages, the habitat pages, and weather pages over and over. Click the link above for samples and a table of contents. My favorite set of all is the North American Bird set. I printed out the table of contents and posted it near our window and when we see a new bird and identify it, we check the list to see if we can print out a corresponding notebook page to include in our nature journal. 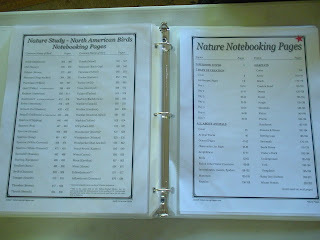 In fact, I recommend the whole Bird Nature Study set. We used it in the Outdoor Hour Challenges for birds every week. You can click over and see the samples of the All About Birds set, the Tropical Birds set, and the Birds of the World set. This brings up another great point about using pre-made notebooking pages. Once you invest in the pages you have started to build a library of topics and styles to choose from year to year. I am pretty sure that I purchased our history set three years ago and we are still using it even in our high school years. I decided that they would make a great way to record some narrations on world religions as well. 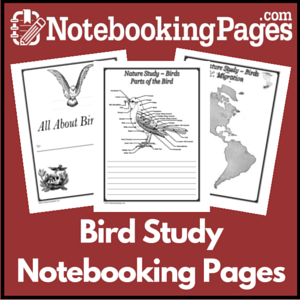 If you are still not sure about using notebooking pages in your homeschool, you can always give it a try using her free pages. 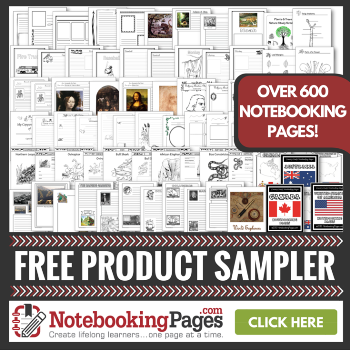 Free Homeschool Notebooking Pages. She has some great resources available including timeline pages, maps, lap book templates, and pages to use with Tapestry of Grace. Please know that I am affiliate for NotebookingPages.com and will receive a small commission if you eventually purchase something from her awesome lineup of products. Thank you for the idea of the table of contents! Excellent idea! I have had so many opportunities where I have usable files on-line but I don’t realize it until it’s too late. I’ll certainly be working on this. Thanks! I’m excited to incorporate notebooking into our learning! Thanks for sharing your idea about the table of contents. I really fell in love with the picture study and music listening sheets and plan to incorporate them into our Harmony Fine Arts lessons. Thank you for the great idea about printing out the tables of contents from sets of notebooking pages that are purchased. That is a great idea! Thanks for the handy tip! Hi Barb! I think printing the table of contents a good idea too! I have this set. I have had it for a long time but never used them. Maybe now we will. 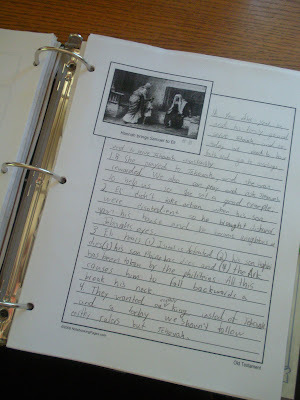 Great post on notebooking in the CM homeschool. I do the same thing you do. I print the TOC for any ebook, notebooking set, timeline set. It’s the ONLY way I can keep track of what I have. I was looking through your blog and came across this post. I read it when you first posted it and immediately tried the “table of contents” idea for the notebook pages. I wanted to let you know that I love it! It is so easy to look through and find what I need for the week. Thank you so much for sharing this idea.